German moutaineers get their climb on in North Face. The contest is over. And the two winner, chosen by Random.org, are Anita and Matt! Congratulations! Please email your mailing address to lhlerman@gmail.com before July 17 to claim your prize. 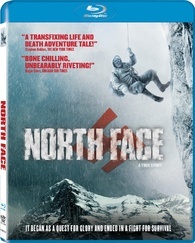 The acclaimed 2008 adventure film North Face was finally released on Blu-ray today and Music Box Films has given Disc Dish two copies to give away to a pair of readers! Directed by Philipp Stölzl and starring Benno Furmann, Florian Lukas and Johanna Wokalek, North Face is based on the true story of a 1936 attempt to scale the most dangerous rock face in the Alps, the North Face of the Eiger, by two competing climbing teams. 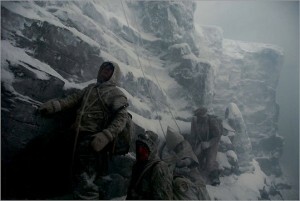 One team consists of German climbers are Toni Kurz and Andi Hinterstoisser, who quit their service in the German military in order to make the attempt. The competing group of Austrians that eventually team up with the German team are portrayed as men who are hoping for a Nazi-led incorporation of Austria into Germany. And so, political unrest and the threat of war heat up as the quest to climb the peak becomes a desperate fight for survival. A New York Times Critic’s Pick that was described by the newspaper of record as “a transfixing life and death adventure tale” and by Roger Ebert as “bone chilling, unbearably riveting,” North Face is the perfect to pop in if you’re looking to cool down with a Blu-ray this hot summer. 1. If you don’t already, Like Disc Dish on Facebook, Follow Disc Dish on Twitter or subscribe to Disc Dish by email (see the box on the right), then leave a comment on this page saying whether you’re a Facebook or Twitter fan or email subscriber. That gives you one entry. If you only do this step, you’re entered, but keep reading for more chances to win. 3. Repeat steps 1 and 2 every day for even more chances to win. This giveaway runs through midnight on Tuesday, July 2, and the winner will be chosen by Random.org and announced here on Wednesday, July 3. Make sure you check back to see if you won. The winner must contact us by July 15 to claim the prize. NOTE: The contest is only open to readers who are 18 or older and in the U.S., with no post office boxes. Couldn’t get tweet connection to work so tweeted link to contest hope this counts. email subscriber to the newsletter. I FOLLOW DISCDISH ON FACEBOOK.